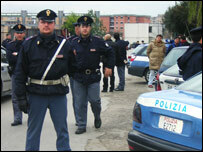 Italian police say they have arrested at least 42 people as part of a huge operation against organised crime. Officers were acting on more than 50 arrest warrants issued against suspected members of the Naples mafia, known as the Camorra. A war between rival factions of the Camorra has been blamed for recent violence in Naples which has left more than 130 people dead in the past year. The head of one of the gangs was arrested in Spain on Saturday. Raffaele Amato was apprehended on Saturday night as he left a casino in the Spanish city of Barcelona. Among the suspects being sought on drug trafficking charges in Naples on Thursday is reported to be Paulo de Lauro - the alleged head of the rival faction. His son Cosimo di Lauro was arrested by Italian police in January. Following the arrests of Mr de Lauro and Mr Amato, Interior Minister Giuseppe Pisanu said the two sides had been "decapitated".